I approached the business and first class check in desk. The rugs were 21cm wide, and 48cm long, and clearly had been walked on before. This instantly made me question whether reports I’d read on Flyertalk about the decline of Cathay Pacific were in fact true. If dirt could get on a rug on a floor of a major airport, what else could Cathay Pacific be doing wrong? Following that lead, I immediately waved my OneWorld Emerald card, yet no one from the airline desk seemed willing to push the passengers they were assisting aside, to handle my boarding pass requirements. The check in agent neglected to ask me about my tenuous journey to the airport. No personal touch – just a boarding pass. After the hassle of security, I made my way to the lounge, if you can call it that. Now, I know this is only a business class lounge, but hello – where’s the waiter service? Already less than amused, I found a seat amongst the circus of people and settled for sparkling wine. Can you believe that a five star airline like Cathay Pacific refuses to pay the extortionate fees required to serve Champagne here in Bangkok? I can tell the difference, trust me. I took an afternoon wine course once after an afternoon at some vineyards. I picked up my TGI Friday’s style buzzer from the guy at the counter making the food. He smiled, but it just didn’t seem genuine, you know? My pad thai was just ok. This is Bangkok, and for my free meal in an airport with 250 passengers at a time, I expect Jay Fai quality noodles. This simply ranked on the scale of most thai meals. Also, the showers were just meh. I could’ve just used one of the 8 Priority Pass cards I hold, from the eight $450 a year credit cards I have to get into a different lounge. Maybe next time? I made my way to gate G5, which was approximately a 321 pace walk, at a heading of 36° NE. I promptly told the gate staff that I am a well known blogger, and that I should be first to board. I was allowed to sit in the handicapped section near the door, so that I could nab the first to board title. FTW. What’s priority boarding for anyway? I mean, right? Don’t you guys agree? As people eyed up spots near me in the handicapped section, I was able to use my Amex Platinum card to reflect the light from the windows into their eyes to push them back. I then used my actual sea of Priority Pass cards to eye burn the rest. If my flight had been delayed, which it wasn’t, I could’ve bought my own toilet paper, rather than using the stuff at the airport, thanks to the delay protection that kicks in after a mere 12 hours. Having flown first class once on a Delta domestic flight from Philadelphia to Washington DC, I had a lot of relevant experience with which to compare this business class “bed”. Upon boarding, it sure didn’t look much like a bed. I read that business class means beds, and all I found was a big seat that looked like forest moss was growing on it. Chic? No. Bed? No. After dinging the call button for the second time prior to take off, I was told that with the press of a button, the seats turn into beds. Couldn’t they just start with each seat in full bed mode, like in the press images they send to our office? It caused a lot of confusion and got me stressed before takeoff, but after a tweet to the airline, I was assured they would take this into consideration. My television offered 200 movies and 40 TV shows. With flights up to 14 hours long, I just don’t think that’s enough content. I mean, I had to settle on Save The Last Dance 2, and while it’s a triumph of cinema, I think they could invest in more content. The TV was 21 inches wide, which is half the size of my TV at home, which really deteriorated from the viewing experience. I’m pretty sure it wasn’t UHD, just HD. How is that acceptable in 2018? I tweeted this to their team as well, and they said they’d take my feedback of doubling the size of every business class TV on board, and be sure to keep Save The Last Dance 2 on the permanent roster. At the time of writing, no response has been received, but we’ll update as progress reports come in. After a short rest we were on final approach. The purser came through to thank me for flying Cathay Pacific, but much like the guy making pad thai, I just didn’t buy it. I just didn’t feel like I was the most important customer she had ever served, and for this reason I am going to leave a bad TripAdvisor rating. She said the exact same spiel to the person behind me, which made it feel as if she was just doing her job, and not indeed a massive fan of my travel blog. Fortunately I was able to get some of the $20 in taxes I paid for the flight, in addition to the 15,000 points by using my Amex Centurion card. At $2500 a year in annual fees, it’s a bit steep, but when it can save you $20 on airline fees – it really adds up. Maybe not to $2500, but it feels really cool. This was not the best business class flight I’ve ever taken, even though it’s the only one I’ve ever taken. Was it worth 15,000 points? Maybe. Was Singapore Suites much better? Totally. 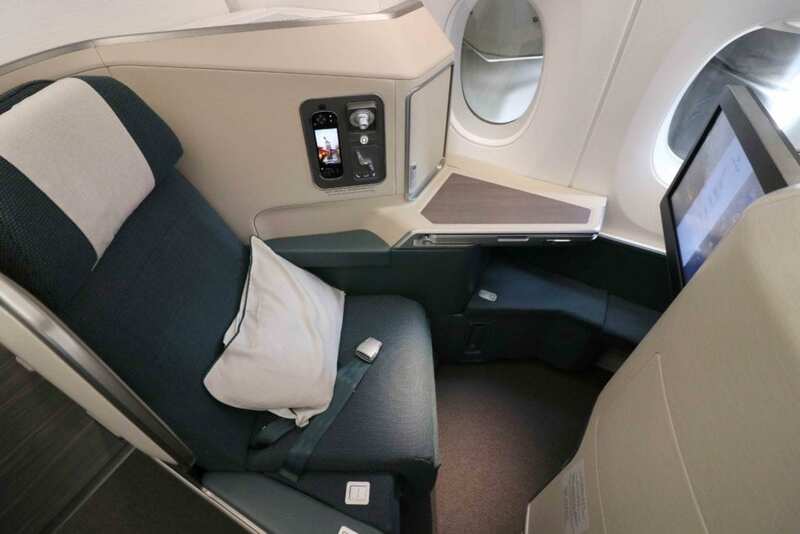 If you get three premium credit cards a month for the next 12 months, you too can fly Singapore Suites and avoid the supreme mediocrity of flat beds in the sky, if you can call them that. I’ll certainly look for business class experiences, all one of them known as EVA Air, which offer vintage champagne next time, since this will help to justify the $20 surcharges. 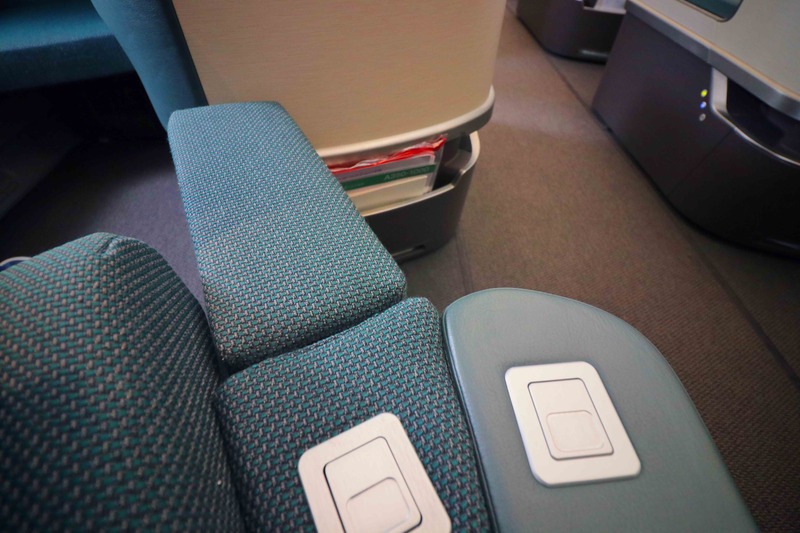 We’ve contacted Cathay to see how progress on doubling the size of TV’s, and making the beds look pretty before the flight is going to avoid further confusion. We’ll update this article once we hear back. I am simply gob-smacked by the sarcasm and pettiness evident in this review. Clearly you felt you deserved more recognition than you actually received and so your review has taken the form of a textbook rant. It’s not satirical in the slightest as it is completely laced with venom and spite. I can only assume that you wrote this when you were not at your best, under the influence of something you may have drunk perhaps, as your comparisons are not even logical (e.g. you compare CX business class with SQ suites! I am highly respectful of people in their workplace and your meanness is unnecessary. Are you smiling warmly as you read this in your place of work? Thank you for providing this example of blogging. There are many lessons for others in this. I hope Nicholas Masse (Manager – Loyalty Programmes) takes a good look at this. I’ll let him know its worth a read! I duly apologize for any confusion, but this is not an actual review. The pettiness evident in the review was satire aimed at bloggers from a well known website (not on boarding area) which actually write things like that, and believe in it. I am sorry that you thought this was an actual comparison and hope Nicholas Masse finds it more enjoyable and refreshing than you did. If you read any other review or viewpoint on the site, you’d quickly see that this was a joke at other writers expense, and in no part the expense of Cathay, their wonderful employees or anyone else. hahaha. Genuine funny! you sure you are not OMAAT. I like the details of walking in the plane from door L1 and then walk all the way to door L2 …simply brilliant. That was a savage and hilarious rip on someone; thankfully, even though I’m a regular reader of tons of points blogs, I’m not sure who. I actually laughed out loud. Great work! For next time…You can heat your nuts by using the reflection of your Centurion card…. This is just a mediocre review. meh. Next you should try a different style of review, one where you are given a free flight for the purpose of a review, but then don’t really review it – saying things like ‘I don’t know what the IFE was like as I didn’t bother to look at it’. Also please trash talk a lounge and then say you don’t know what the entry requirements are, despite it being very easy to do a tiny bit of research (on their website) to find out. I also look forward to a week full of blogs (ads) for a Virgin credit card. It’s satire, and that’s entirely the point. it’s not an ACTUAL review. I would never utter virtually any of those phrases without jest. Top notch as usual. Worrying that there are others with no humor lol. Mind you, they’re the same people who drive with no lights on in bad weather and vacantly plough through everyone with their trolleys in the supermarket. Good job. I’m just curious, last time I was there (July) they served Moet et Chandon for their “sparkling wine” at the lounge.. I believe it’s Chandon, and not in fact Moet. I believe it’s their U.S. Sparkling arm. Lol, I hate CX… But this story is something else. The sarcasm here is just great! Great “review”! Almost thought I was reading a review from another one of your fellow travel bloggers! Hey whenever I get to fly business or first, I just feel “Lucky” to get a seat that reclines more than a few inches! Lol!